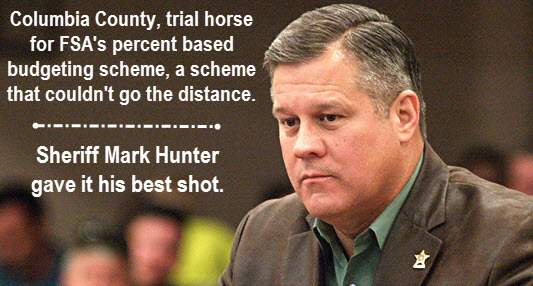 COLUMBIA COUNTY, FL – Thursday, March 7, 2019, Sheriff Mark Hunter's percent based budgeting deal with the Columbia County 5 almost faded quietly away. After the motion was made to end the agreement, the discussion began with some humor. 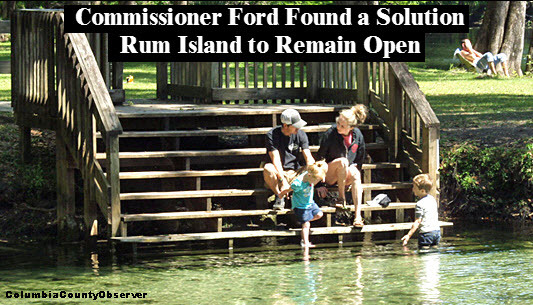 Commissioner Witt said, "I'm only going to be a minute. I'm not going to do a Tim Murphy and make a long speech." Everybody chuckled. There were no more chuckles. COLUMBIA COUNTY, FL – Commissioner Tim Murphy has a passion for politics, economic development, and talking. 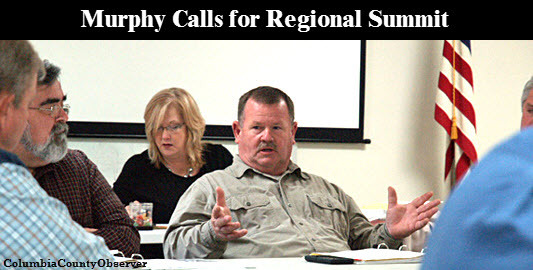 At yesterday's Economic Development Advisory Board meeting, Mr. Murphy demonstrated all three and announced that he is looking to have a regional summit to bring Columbia County's sister counties to the table so they are all heading in the same direction. COLUMBIA COUNTY, FL – Each spring, a nation-wide high school arts competition is sponsored by the Members of the U.S. House of Representatives. The Artistic Discovery Contest is an opportunity to recognize and encourage the artistic talent in the nation, as well as Neal Dunn's Congressional District 2 of Florida. COLUMBIA COUNTY, FL – On February 12, 2019, the Florida Gateway College Board met in Baker County for its monthly meeting. Neither the Olustee Battle Reenactment nor the Battle Festival was anywhere on the College's agenda. Columbia County residents Merrillee Malwitz-Jipson and Jim Tatum brought the item up, which inspired FGC Board member and Florid Representative Chuck Brannon to throw up his arms in exasperation and tell the Board, "I'm not in agreement to what I am hearing today. And I am not going to just sit here and not say anything." 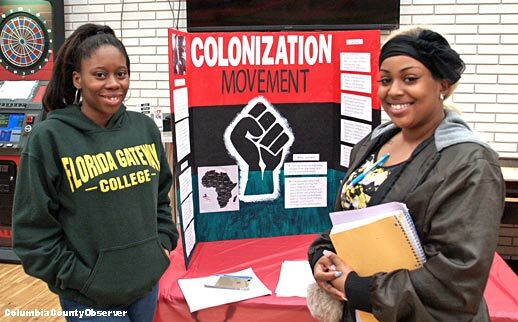 COLUMBIA COUNTY, FL – Yesterday, February 13, 2019, the Florida Gateway College Campus Activity Board sponsored a Black History Festival in the Student Activity Center. 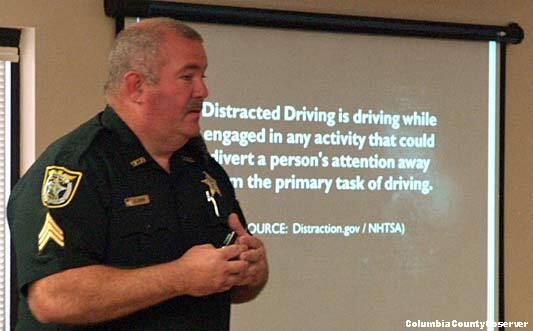 COLUMBIA COUNTY, FL – As the January 23, 2019 Tourist Development Council (TDC) meeting got underway, TDC Director Paula Vann announced, "At the last TDC meeting I brought up that the hotel owners were asking that we do some improvements or ask DOT to do some improvements at the I-75 and Highway 90 exit." As a result, Ms. Vann invited Florida Department of Transportation's (FDOT) landscape team to the TDC. Twenty minutes after the meeting began, DOTs Marty Humphreys said, "We have a little issue out there... We've been working with law enforcement." 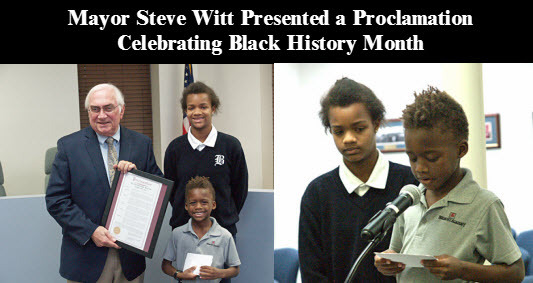 LAKE CITY, FL – Last night in City Hall, Mayor Steve Witt proclaimed the month of February Black History Month. COLUMBIA COUNTY, FL – In nineteen days, the Olustee Battle Festival, the annual celebration of the February 20, 1864, Baker County Battle of Olustee, begins. 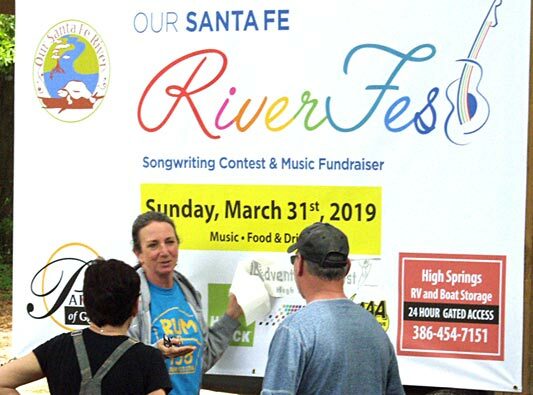 Folks from all over the world will converge on the area to fill local hotels, fill up at fast food emporiums, and visit downtown Lake City for an "arts and crafts festival." The center piece of the event is the Olustee Battle Reenactment. Thousands of white people along with their children, many waving the Confederate Battle flag, will be cheering their Confederate heroes on to victory while watching Americans blowing each other's brains out. LAKE CITY, FL – Late Thursday afternoon, January 24, 2019, the Middle and Lower Suwannee River Task Force (the Task Force) met for its second meeting. The Task Force has members from 12 N. Central FL counties and while all counties do not front on the Withlacoochee and or Suwannee Rivers, the officials have banded together to help find a solution to the multi-million gallon raw sewage spills coming out of Valdosta into N. Florida. 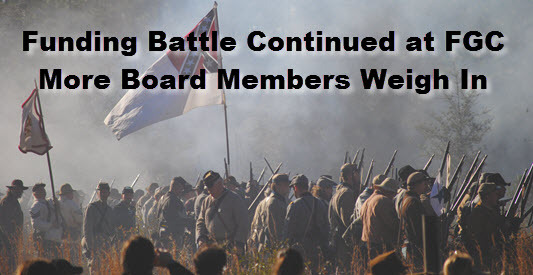 COLUMBIA COUNTY, FL – The Lake City Reporter recently reported on the January 8, 2019, Florida Gateway College Board meeting, a meeting in which the board voted unanimously to end funding for the Olustee Battle Festival. The College Board is composed of gubernatorial appointees, six of whom were present: a banker, three educators, and two physicians. Three of the six are long time Columbia County residents. 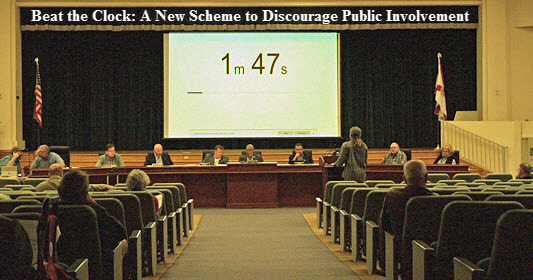 COLUMBIA COUNTY, FL – Thursday evening, at the bimonthly meeting of the homeless County Commission (the County 5), the public was in for a new surprise: a giant 2 minute warning clock projected on the screen at the front of the school district auditorium, the home away from home of the homeless County Commission. None of The 5 acknowledged the countdown clock and no one would take ownership of it. If a speaker didn't beat the clock, an annoying buzzer went off, without shutting off until the speaker left the microphone. The board members thought that was pretty funny. 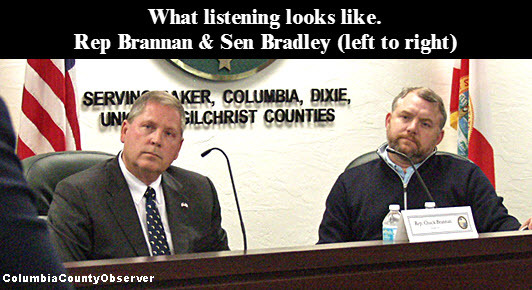 COLUMBIA COUNTY, FL – On Monday, January 14, Senator Rob Bradley, one of the most powerful people in Tallahassee (chairman of the Senate Appropriations Committee), and considered by many to be one of Tallahassee's sharpest elected officials, and newly elected Representative Chuck Brannan, listened to various government representatives asking for money. However, along with the bevy of local officials, were everyday citizens who came to voice their concerns from climate change to education and things in between. COLUMBIA COUNTY, FL – Senator Rob Bradley (R-Fleming Island), Chairman of the Columbia County Legislative Delegation, will preside at the annual delegation hearing today, Monday, January 14th at 1:00 pm. The location of the hearing is the Florida Gateway College Administrative Bldg 1, Board Room located at 149 SE College Place, Lake City, Florida. 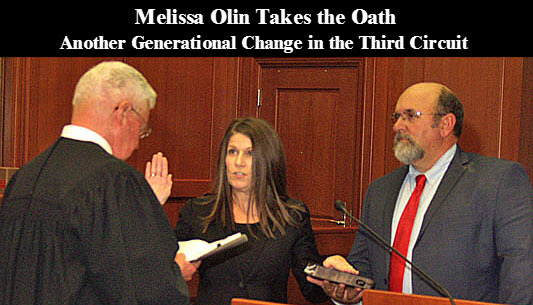 COLUMBIA COUNTY, FL – On Friday afternoon, Melissa Olin was sworn in as a Circuit Court Judge in the Third Judicial Circuit of Florida. Ms. Olin, 48, a former Assistant State Attorney and a UF graduate, continues the generational shift begun with the election of Judge Wesley Douglas and continued with the elections of Judge Mark Feagle and Dixie County County Court Judge Jennifer J. Johnson. 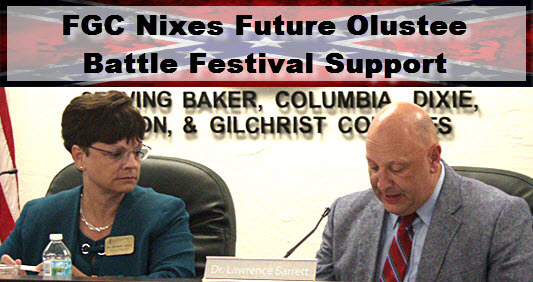 COLUMBIA COUNTY, FL – Last night, Florida Gateway College (FGC) Board Chair Suzanne Norris was the only board member who exhibited any discomfort with the support of Lake City's infamous Olustee Battle Festival, which celebrates the victory of the South over the North in the 1864 Battle of Olustee in Baker County. FGC President Larry Barrett signed a contract in July supporting the festival. 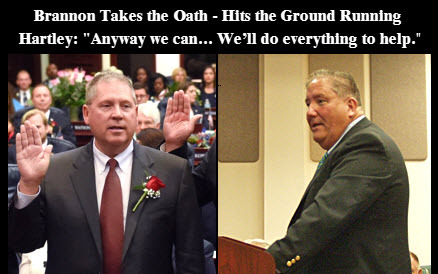 COLUMBIA COUNTY, FL – Last night's meeting of the County 5 concluded on an upbeat note when Commissioner Murphy invited Representative Brannon's District Secretary to the microphone, "We've got Representative Brannon's associate here. Step up and introduce yourself." COLUMBIA COUNTY, FL – On the County 5 docket tonight, January 3, 2019, at its first meeting of the year, is approval of the Governor Scott approved DEO $10.2mil Waste Water Treatment Plant (WWTP) Grant for the east side of the County. The County's Neanderthal IT policy kept the County Economic Development Department from receiving the grant contract for over two months.